Contemporary kitchen pantry in Brisbane with an undermount sink, flat-panel cabinets, white cabinets, window splashback and light hardwood floors. 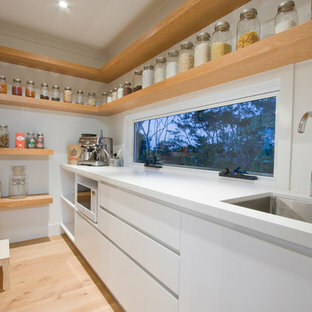 This is an example of a mid-sized traditional kitchen in San Francisco with a farmhouse sink, stainless steel appliances, dark hardwood floors, white benchtop, shaker cabinets and white cabinets. Inspiration for a transitional kitchen in Baltimore with a farmhouse sink, shaker cabinets, black cabinets, marble benchtops, stainless steel appliances, medium hardwood floors, marble splashback and white benchtop. Large traditional galley kitchen in Portland Maine with a farmhouse sink, shaker cabinets, white cabinets, granite benchtops, white splashback, ceramic splashback, stainless steel appliances and medium hardwood floors. 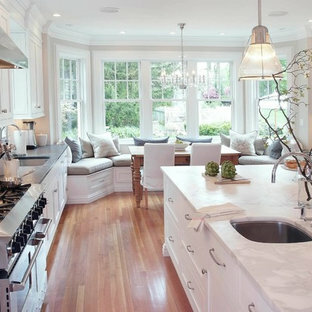 A fresh traditional kitchen design much like a spring day - light, airy and inviting. 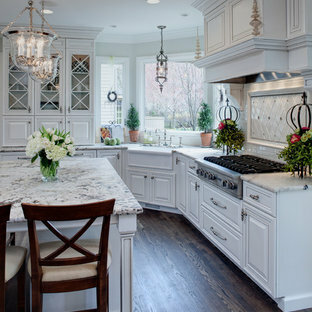 Traditional kitchen in Chicago with a farmhouse sink, raised-panel cabinets, white cabinets and white benchtop. 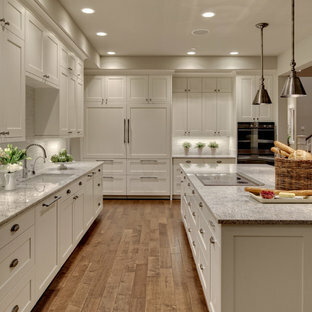 Inspiration for a traditional eat-in kitchen in Dallas with a farmhouse sink, recessed-panel cabinets, white cabinets, white splashback, marble benchtops and grey benchtop. Inspiration for a contemporary galley kitchen in San Francisco with an undermount sink, flat-panel cabinets, dark wood cabinets, marble benchtops, white splashback, stone slab splashback, stainless steel appliances and white benchtop. 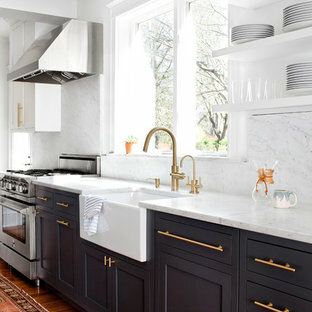 Inspiration for a traditional eat-in kitchen in Minneapolis with stainless steel appliances, marble benchtops, white cabinets, grey splashback, stone tile splashback, an undermount sink, recessed-panel cabinets, dark hardwood floors and white benchtop. The nearly 10’ island is an ideal place for food prep, a quick bite, buffet set-up, or sharing a glass of wine with friends. 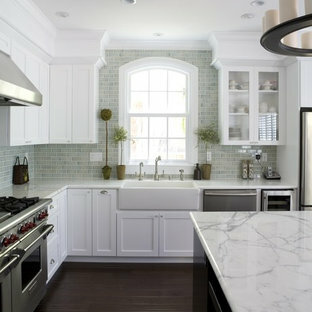 2.5” thick marble countertop on the island gives substance and a professional feel. Looking across the peninsula toward the sink and bamboo cabinetry at the window wall in an Eichler mid century modern home in Lucas Valley (San Rafael, CA). Thom Harrison - AlterECO, inc.